We are pleased with the efficiency and cost savings we have experienced using the InvoTech Linen and Uniform Systems. I expect the cutting-edge technology to reduce costs and help manage inventory more effectively at our newly opened property. InvoTech Systems Inc. announced the recent implementation of its Linen & Uniform System at the recently opened Ocean Resort Casino Atlantic City. InvoTech Systems is the leading provider of advanced Linen Management, Laundry and Uniform Systems that integrate the latest RFID technology to increase profitability for hotels, resorts, casino operators, sports arenas, convention centers and theme parks. 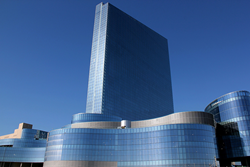 The InvoTech Systems installed at Ocean Resort Casino will manage the uniform inventory for approximately 3,500 employees, and 10,000 linen items. The resort joins InvoTech’s extensive client portfolio of Hotels & Resorts worldwide. Click here for more information on InvoTech’s Linen, Laundry and Uniform Systems. Ocean Resort Casino implemented InvoTech’s Linen & Uniform System to maximize cost-savings immediately upon its grand opening in June. InvoTech has extensive experience in implementing systems for new properties, which they ensured all uniforms were issued and recorded, and coordinated for the linens to be delivered with washable RFID tags already inserted into each piece before the grand opening. On-site installation and training services are provided for the staff so that clients obtain the maximum ongoing cost saving benefits. InvoTech's Uniform System establishes a perpetual uniform inventory and has extensive reporting capabilities to determine and forecast appropriate uniform purchases. The system tracks uniform inventory without manually sorting and hand-counting. Uniform cleaning costs are entered into InvoTech and reports may be quickly generated to audit laundry expenses to update budgets. The improved processes and information provided translates to significant cost saving benefits by eliminating losses, reducing purchases, and lowering laundry expenses and labor costs. The system integrates with automated uniform conveyors to distribute the uniforms to employees, and to automatically record which uniforms are taken by employees. The system typically delivers an average of 25% savings in labor costs and a 5% reduction in on-going purchases, a major bottom line savings for a property of Ocean Resort Casino’s size. “We are pleased with the efficiency and cost savings we have experienced using the InvoTech Linen and Uniform Systems. I expect the cutting-edge technology to reduce costs and help manage inventory more effectively at our newly opened property.” said Cindi LePine, VP Hotel Operations. The Linen System will manage Ocean Resort Casino’s high-quality guestroom linens. The hotel has approximately 10,000 linen items for the 1,399 well-appointed guestrooms. The hotel will use a RFID Laundry Cart Reading Station with an easy-to-use touch screen monitor that instantly identifies and counts linens in laundry carts. The system functionality allows Ocean Resort Casino to automatically track linens to and from the laundry. This eliminates the daily task of physically separating the different types of linens and then hand-counting and manually-recording. It provides a 100% reduction in non-theft related losses, cuts labor costs by approximately 50%, and provides control of outside laundry charges. InvoTech Director of Sales & Marketing Oswald Lares said, "Operators in large organizations recognize that InvoTech’s solutions increase profitability. The growing global adoption of our advanced, easy-to-use Linen and Uniform solutions deliver a huge gain in operating efficiency. Plus, the money our systems save by reducing non-theft related loss to nearly zero goes straight to the bottom line.” InvoTech’s RFID technology monitors and controls linen movement throughout a property and to/from its laundry. It provides 100% reduction in non-theft related losses, cuts labor costs by 50%, and provides control of outside laundry charges. Ocean Resort Casino is managed by AC Ocean Walk, LLC. The luxury resort will be a new welcomed addition to the Atlantic City Boardwalk, contributing to the city’s recent revival. InvoTech has over 600 satisfied clients worldwide in more than 30 countries, including hotels, resorts, casinos, theme parks, stadiums, arenas, convention centers, medical centers, cleanrooms, and laundries. Why InvoTech? Because major brands like Hyatt, Marriott, Ritz-Carlton, Hilton, MGM International, Wynn Resorts, Caesars Entertainment, Universal Studios, LEGOLAND, Intel, Pfizer, Madison Square Garden, and Staples Center rely on InvoTech Systems to provide operational efficiency, full-accountability, and turn-key solutions for laundry, linen and uniform management. See what our clients are saying about us. InvoTech Systems provides the most advanced inventory management systems for uniforms, linens, and laundry operations. Our very reliable and easy-to-use systems integrate the latest RFID technology to significantly improve operational efficiencies to eliminate losses, reduce purchases, cut labor costs, and lower laundry expenses. InvoTech provides solutions for hospitality, healthcare, cleanrooms, stadiums and arenas, theme parks, commercial laundries, and many other industries worldwide. With over 20 years of experience providing inventory management systems, InvoTech is known for our expertise and reliable solutions tailored to our client needs and outstanding customer support. Visit our website to find out more. The iconic Ocean Resort Casino sits on the New Jersey Boardwalk and is the tallest building in Atlantic City, offering unparalleled ocean views from each of its 1,399 guest rooms and suites. Situated on 20 acres, Ocean Resort Casino is part of The Unbound Collection by Hyatt Portfolio and features a 32,000 square foot on-site Exhale spa, a 140,000 square foot gaming floor, a state-of-the-art sports book in partnership with William Hill, six swimming pools, expansive meeting and convention space, and distinctive dining and entertainment options. Additionally, Ocean Resort Casino offers an industry-leading loyalty program, Ocean Premier, that provides guests at all tiers with valuable incentives and benefits. Ocean Resort Casino is owned and operated by AC Ocean Walk, LLC. For more information, please visit us online at theoceanac.com, on Twitter, Instagram, Snapchat at @theoceanac or via Facebook at Ocean Resort Casino.